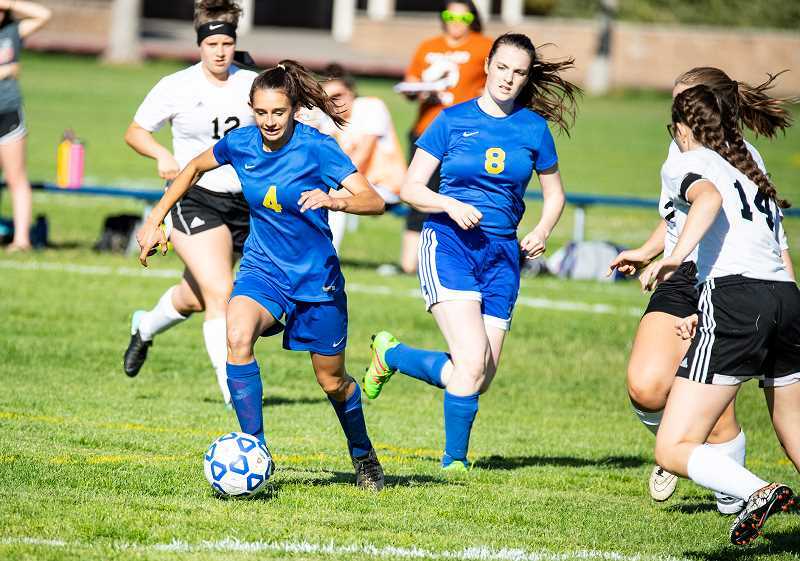 The Crook County Cowgirls broke a 20-game losing streak on Tuesday as they rolled past the visiting Dallas Dragons, taking a 9-0 win. "We did absolutely amazing," senior forward Gracie Kasberger said. "I'm just really happy that we won so early in the season." The nine goals were more goals than the Cowgirls scored in the entire 2017 season and equaled the team's goal output for the last two seasons combined. The Cowgirls have now scored 11 goals this season, their highest scoring total for a year since the team scored 12 goals in 2012. "We have been on the other end, so I didn't want to run up the score just because we could," Crook County High School head coach Rich Abrams said. "This was a pretty rare opportunity, to be able to move people around like that." Kasberger opened the scoring for the Cowgirls just minutes into the game. 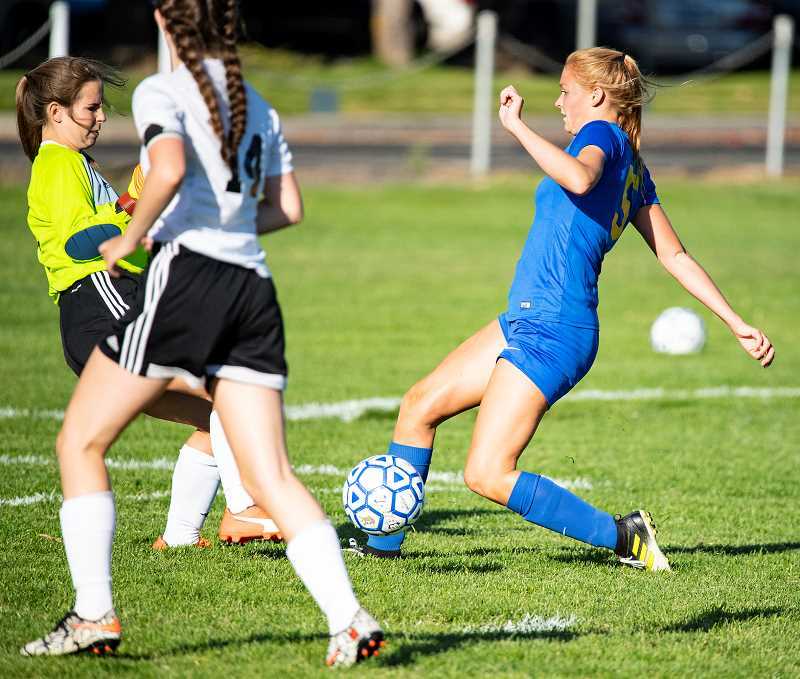 Shortly after, Abrams subbed Kasberger out of the game, and freshman Tienna Quinn took advantage of a rare scoring opportunity, racing from midfield to score an unassisted goal to put Crook County up 2-0. Then, late in the first half, Kasberger re-entered the game and picked up her second goal of the contest, putting the Cowgirls up 3-0 at the half. Kasberger scored her third goal of the match less than a minute into the second half, giving the Cowgirls an insurmountable 4-0 lead. From that point on, Abrams altered his lineup, moving Kasberger to defense, while moving his defensive players to the middle of the field. The change didn't slow the Cowgirls at all, as their goal scoring onslaught continued. Senior Faith Wagner picked up a goal just seconds after Kasberger's final goal, making the score 5-0. "We all pretty much bonded last year, and the freshmen we got to know and love really quick," said Wagner, who gave up a nearly sure scoring opportunity late in the contest to pass the ball to a teammate who had not scored in her career. "I feel like this year there is a lot more love. If we keep on acting like this and staying so close and positive, it's definitely going to have a great outcome. I felt good because everyone got the chance that they deserved." Sophomore Teagan Freeman scored the Cowgirls' sixth goal of the contest, followed by a goal from senior defender Emma Hehn. Emma Bales, who normally plays on the JV team, scored the final two goals of the contest for the Cowgirls as they shut out the Dragons. "Emma may not play varsity again this year, but she made the most of her opportunity," Abrams said. He added that the Cowgirls made a major improvement in their second game of the year, a 5-2 loss to the Madras White Buffalos. He believes that game plus the shutout victory will bolster the team's confidence. "I think we made huge strides at Madras," he said. "So that really helped them a lot coming into this game. They felt a lot better. Then today, the first half we were mostly in a frenzy trying to get something out of this and then the second half, they settled down and started passing to open players and getting the ball to open spaces. They were like we have been before. Once the second half got going, you could see how they dropped off because they were tired." With the win, the Cowgirl improved to 1-2, while the Dragons fell to 0-1. The Cowgirls are back in action next Tuesday, Sept. 11, when they host the La Pine Hawks in a 5 p.m. match.